It is hard to know what to write today - because I am writing this in the past. Today's landscape may be very different from yesterday's. Are we a nation irrevocably divided or a nation still hanging together by a thread? You, reading this, will know if Scotland is still with us. I do not yet. It is a rare thing to realise, in advance, that a day of history is happening. Normally we can only look back and see with hindsight that it was so. Sometimes it's a small thing - a pebble which rolls a little way, almost unnoticed, and then sets off an avalanche of global proportions. Sometimes it's something so epic, so inconceivable, that it is itself the avalanche. As writers and readers, I think we have a responsibility to mark days of history, even if only for ourselves. So I ask this of all of you reading this, writers or not: will you write today, please? Whichever side of the debate you have been on, - yes, no, or none - will you write down your experience of it so that future generations can know how you felt today? Whether you choose fiction or fact doesn't matter, whether you publish or keep it private doesn't matter. What matters is that it's there, a body of evidence for future generations if they want to read it. I will come back later today and write down my own reactions below. It will probably be a very emotional addendum, whatever the result. I am a Scot, after all. "I wake all at once, dumped rudely out of sleep, ears full of the morning twittering of the blackbird in the apple tree. He is louder than usual, his song urgent, a reveille. My heart gives a great bang, and my inner workings tingle, small jolts of nerve lightning tugging at and twitching my muscles. My belly is uneasy, empty yet clenching, surging upwards. I want to know. And yet, I don't. I lie there, warm, until I can't any more, then I open the shutters. The sudden flood of grey light makes me squint, screw up my blind mole eyes. There are more fallen apples today, and a crow flies away into the dim mist. Am I looking out on a world quite changed from yesterday? I went to bed before midnight, unable to bear the vapid maundering on the BBC. At the bottom of everything then lay the one fact: "We don't know anything, and we're going to tell you so over and over in a myriad ways." The news pundits on Twitter though - they thought differently. Most had already called it for the No camp. I can't bear to turn on the radio or TV yet. Because when I do it will be real - whatever 'it' is. It can't be undone. I won't be able to go back to nervous ignorance. You may wonder why I'm making such a fuss. It's hard to explain. I tried writing a love letter to Scotland earlier in the week. It goes some way to telling you how important this vote is to me. Right now, though, the memory I have which comes closest to the way I feel now is 17 January 1991 when I watched the first planes go into Iraq and wondered, as I laid hands on my three-month-pregnant belly, what sort of world I was bringing my child into. I have the same sense that the world is about to shift under my feet. I can't be a coward any longer. The stairs creak under my feet in the empty house. My fingers slide and stumble on the small round buttons. Oh God! Anticlimax. It's the weather. Hurry up, woman! I want to know now, get it over. Oh, please. I don't care about muggy nights and chilly in rural areas...cloudy, murky, dawn bright over Scotland, the words tumble past, meaningless. The figures flash up on the screen, red and green. Suddenly I'm not sure how I feel as the politicians witter on and on to BBC Hugh. Am I happy we're still together? Yes. I wanted that. I believe in our Union. Yes. Immensely. This is democracy at work. People - old ones and young ones and all in between - have voted in millions. An 86% turnout? There's a tightening in my throat and a prickling in my nose. That's amazing, humbling. But although we are still together, those Scots, my soul brothers and sisters, my family, have changed the landscape of the (still) United Kingdom together and forever through the power of the ballot box. Their voices cannot be ignored, and I find myself on my feet and cheering that. It is time and past time for change. 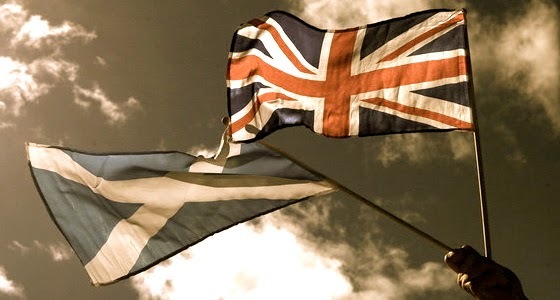 So thank you, beloved Scotland, both the passionate Ayes and the passionate Noes. You have done us all a service. We just don't know the shape of it yet. Millions more words of witness will be written to mark this day of history. These are mine." New dates announced for Lucy's Guardian Masterclass on 'How to Write for Children' Why not book now? Atticus the Storyteller's 100 Greek Myths is available from Orion Children's Books. That is a wonderful idea, Lucy. We assume we will remember how we feel but our memories will be quickly clouded by later emotions, even a few days later. I will do as you suggest. I will write more for myself but here I will just say that, exhausted as I am after 2 two hours' sleep, and as a voter in Scotland, I feel mostly a burden lifted and yet also now the burden on all of us to make this work well for everyone, throughout the UK. Things have changed and most of this change feels good. We have to make it good. Thank you, N - and yes, I agree. We ALL have to make it good. I hope you in Scotland have set an example to the rest of the UK on voting. If only the turnout is similar for the next General Election in May, we might get a government elected by an actual majority of us all. I had mixed feelings about the referendum, about the question being asked and about the way in which my bilingual Scottish ancestors would have voted. We have had clan gatherings here and I have felt an immense sense of pride in the fact that we can come together the way we did. At the last gathering my father was the oldest member of the last generation left and he spoke about "Cuimhnichibh aír na daoine bho’n d’thainig sibh" (Remember the people where you come from.) Yes, I'll do that. I was drifting in and out of sleep,listening to the radio most of the night. I feel a sad relief right now, but so much needs to be done to sort out the whole UK political mess. Your "write about it" while the event is still an immediate experience is a good idea, Lucy. So much slips away. Well, my Scots partner has been telling me the vote would be 'No,' all along. The Scots did us all a favour by loudly shouting, 'We don't like the way things are run and decided in this country!' - But does anybody really think things will change in England? In Scotland, the vote may as well have been, 'Yes,' because this won't go away. Feelings are too strong. If Scotland gets all the concessions they've been promised, England, Wales and Ireland will be resentful. But all sides, instead of blaming those in power, who should be blamed, will probably take it out on those nearest. I hope it all turns out well in the end. Love the idea, even as a non writer. The sense of relief this morning was palpable. My husband is Scottish and I have Scottish ancestry and we both love and adore the country and its people. The thought of being separated was, well, unthinkable. We were heavily emotionally invested but completely disenfranchised. My greatest fear now is that the rampant nationalism which Salmond has released will be impossible to put back in Pandora's Box. The bullying and aggression won't go away. They were there before but better hidden. They're "out and proud" now. The divisions are there for all to see; the country has been emotionally hacked in two by the blunt instrument that is Scottish Nationalism. The lack of grace in defeat sums up the attitude. May Alec Salmond be forgiven. He will have to be forgiven by others as I cannot find it in my heart to do so.